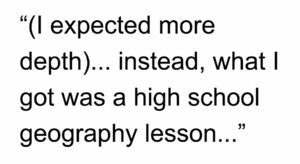 … and you should have learned about in high school in the first place. (Book blurb begins) Maps have a mysterious hold over us. Whether ancient, crumbling parchments or generated by Google, maps tell us things we want to know, not only about our current location or where we are going but about the world in general. And yet, when it comes to geo-politics, much of what we are told is generated by analysts and other experts who have neglected to refer to a map of the place in question. All leaders of nations are constrained by geography. Now updated to include 2016 geopolitical developments, journalist Tim Marshall examines Russia, China, the US, Latin America, the Middle East, Africa, Europe, Japan, Korea, and Greenland and the Arctic—their weather, seas, mountains, rivers, deserts, and borders—to provide a context often missing from our political reportage: how the physical characteristics of these countries affect their strengths and vulnerabilities and the decisions made by their leaders (Book blurb ends). 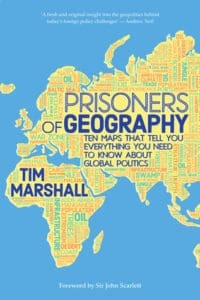 You can purchase Prisoners of Geography: Ten Maps That Tell You Everything You Need to Know About Global Politics by Tim Marshall on Amazon here. Kansas City, Missouri is the largest city in the state and the sixth largest city in the American Midwest. According to the U.S. Census Bureau, the city had an estimated population of 481,420 in 2016, making it the 37th largest city by population in the United States. It is the anchor city of the Kansas City metropolitan area, which straddles the Kansas–Missouri border. Kansas City was founded in the 1830s as a Missouri River port at its confluence with the Kansas River. On June 1, 1850, the town of Kansas was incorporated; shortly after came the establishment of the Kansas Territory. Confusion between the two ensued and the name Kansas City was assigned to distinguish them soon thereafter. 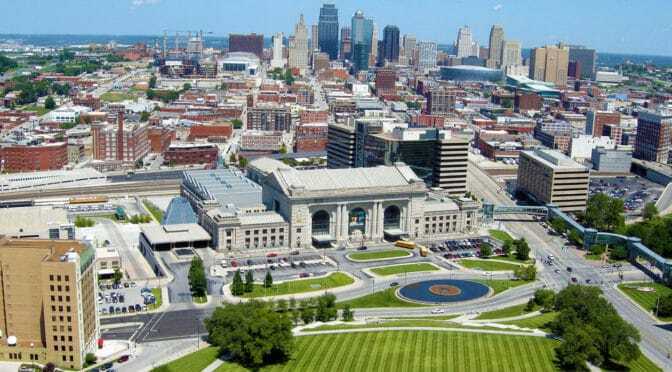 Kansas City, Kansas is the third-largest city in that state and the third-largest city (after Kansas City, Missouri and Overland Park, Kansas) of the Kansas City metropolitan area. The Kansas City metropolitan area is a 15-county metropolitan area that straddles the border between Missouri and Kansas. With a population of about 2,340,000, it ranks as the second largest metropolitan area in Missouri (after Greater St. Louis). Kansas City, Kansas is abbreviated as “KCK“ to differentiate it from Kansas City, Missouri. As of the 2010 census, Kansas City, Kansas had a population of 145,786 residents. (Source: Wikipedia). 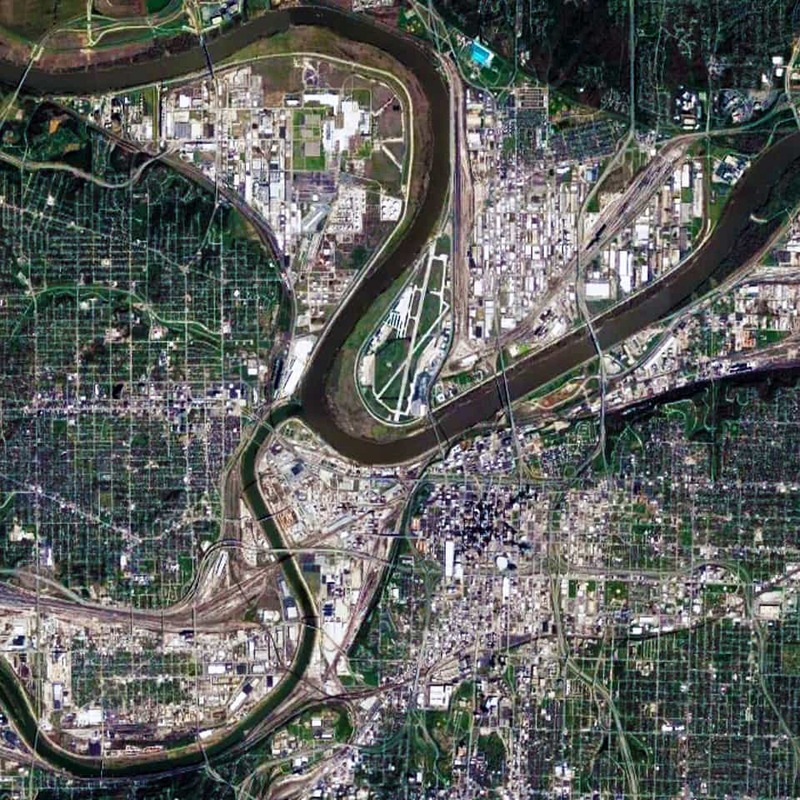 Satellite view from 15 km of Kansas City Missouri-Kansas USA (Source: Google Earth). There are two distinctive characteristics to the urban pattern of Kansas City at different scales of the city. 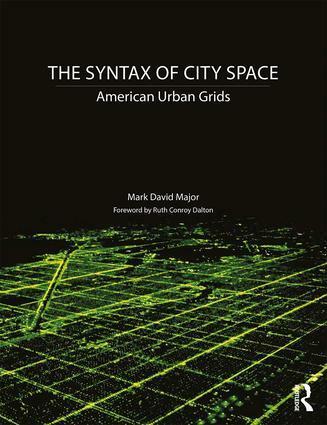 The first is the series of large building footprints and urban blocks composing a series of small-scale (in relative terms) offset grids adjacent to the Missouri and Kansas Rivers. This is most apparent in the close-up satellite view from 15 km of Kansas City (see above). This is a direct result of its historical origins in water transportation, which remains important to this day for the city; namely, the laying out of street networks to ensure a rectangular shape to the plots on the most valuable land immediately adjacent to the rivers. Satellite view from 30 km of Kansas City Missouri-Kansas USA (Source: Google Earth). 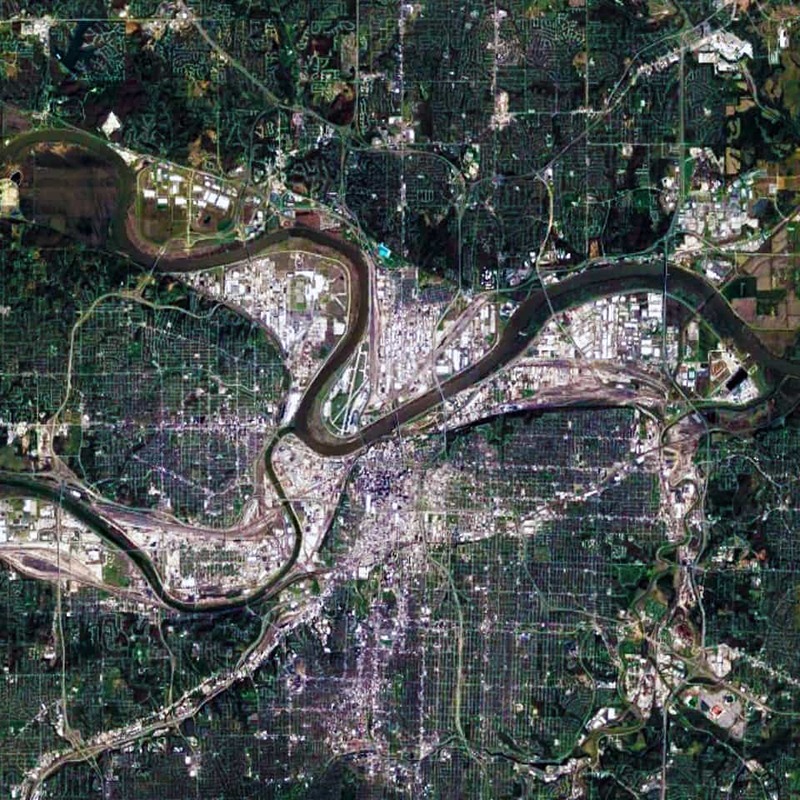 When examining the Kansas City urban pattern at the large-scale (see satellite view from 30 km above), the second distinctive characteristic becomes much more apparent; namely, a strong north-south and east-west structure in the street network of Kansas City. Initially, some people might think this occurred due to the stereotypical view about the ‘flatness’ of the American prairie. However, the topography in and around Kansas City is composed of gentle, rolling hills and river bluffs. Instead, this is evidence of the emergent pattern of the Jeffersonian grid in the 1785 Land Ordinance. 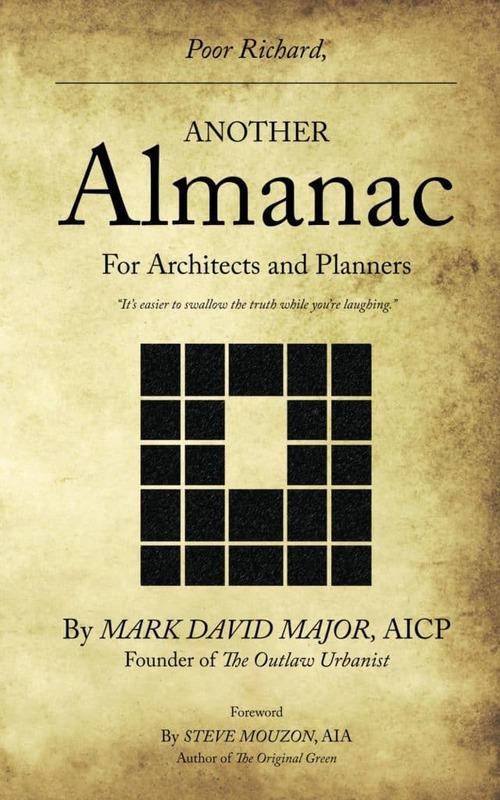 For two-and-a-half years now, The Outlaw Urbanist has brought you a semi-regular feature — as regular as we can manage in the best interests of our mental health — called “Planning Naked.” It has been your (hopefully hilarious) guide to most everything about the latest issue of APA’s Planning Magazine. 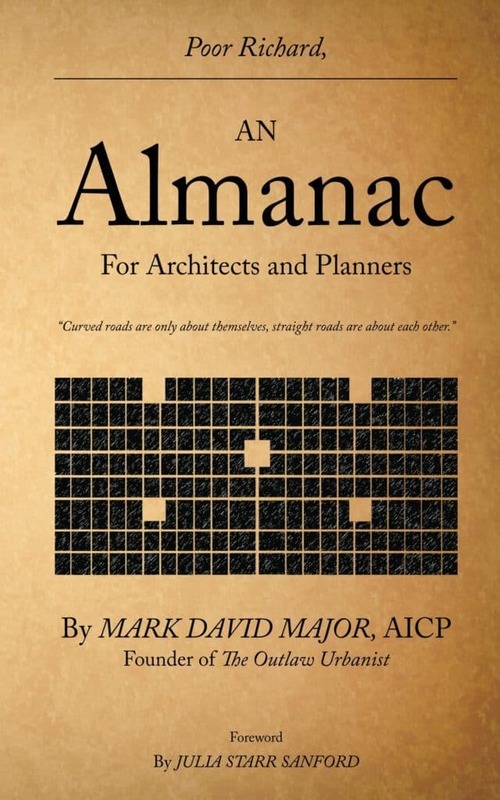 Due to changing circumstances, we are announcing a cessation of the “Planning Naked” feature. Somehow, we think the editors and reporters of Planning Magazine will be relieved to hear this news. If you are interested, email us at info@outlaw-urbanist.com. 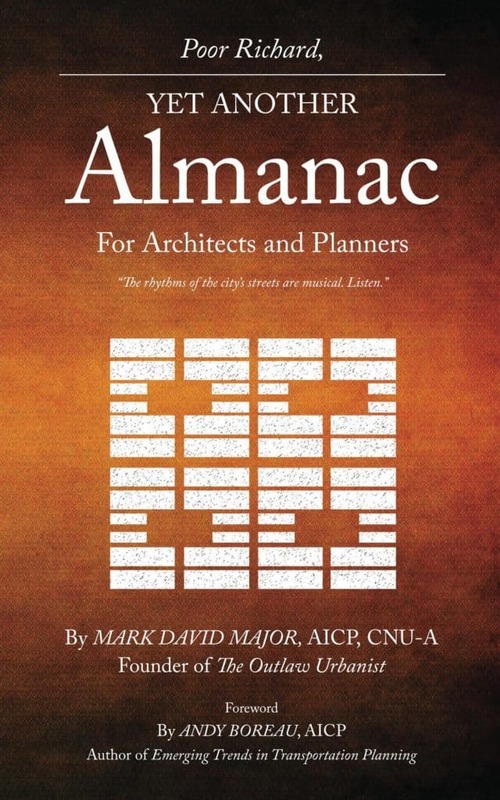 Planning Naked has been a semi-regular feature article with observations and comments about a recent issue of Planning: The Magazine of the American Planning Association. Doha (Arabic: الدوحة‎‎, ad-Dawḥa or ad-Dōḥa) — literally meaning “the big tree” but, locally, “rounded bays” — is the capital city and most populous city in the State of Qatar. Doha has a population of 1,351,000 in the city proper with a metropolitan population close to 1.5 million. The city is located on the coast of the Persian Gulf in the east of the country. It is Qatar’s fastest growing city with over 50% of the nation’s population living in Doha or its surrounding suburbs. It is the economic center of the country. Doha was founded in the 1820s as an offshoot of Al Bidda. It was officially declared as the country’s capital in 1971 when Qatar gained independence from being a British Protectorate. 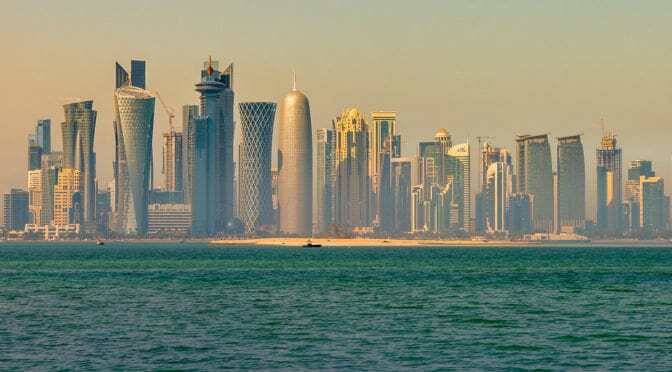 As the commercial capital of Qatar and one of the emergent financial centers in the Middle East, Doha is considered a world city by the Globalization and World Cities Research Network. The city of Doha was formed after seceding from another local settlement known as Al Bidda. 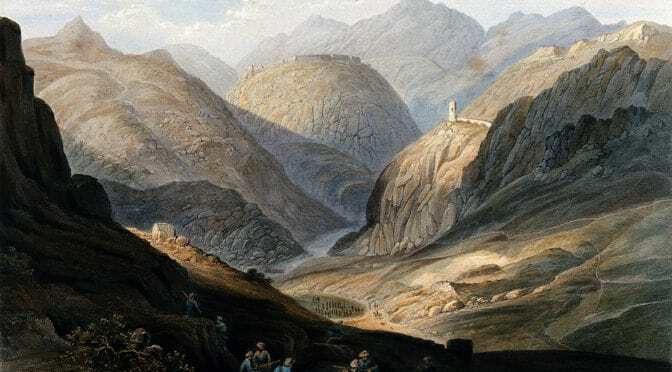 The earliest documented mention of Al Bidda was made in 1681 by the Carmelite Convent in an account, which chronicles several settlements in Qatar. In the record, the ruler and a fort in the confines of Al Bidda are alluded to. Carsten Niebuhr, a European explorer who visited the Arabian Peninsula, created one of the first maps to depict the settlement in 1765 in which he labeled it as ‘Guttur’ (Source: Wikipedia). 1947 Aerial photograph of Doha, Qatar (Source: UCL Qatar). Recently, UCL Qatar created a new interactive map to explore the history of Doha from the late 1940s to the present day here. The Origins of Doha is a UCL Qatar research project, supported by the Qatar National Research Fund, which aims to explore the foundation and historic growth of Doha, its transformation to a modern city, and the lives and experiences of its people through a combination of archaeological investigation, historical research, and oral testimony (Source: UCL Qatar). 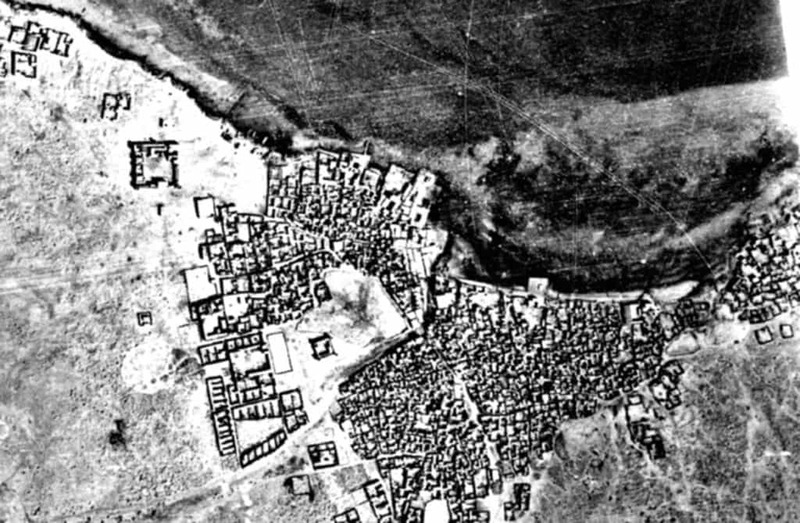 What we see in this 1947 aerial photograph (see above) is a very compact settlement gathered along the shoreline of the Doha Port on the Persian Gulf. The settlement is so compact that it is difficult to discern its spatial structure. However, if you focus on the center of the image, then look slightly southwards and eastwards, you can see a clear ring of circulation around a large block possessing an intricate street network. From this ring of circulation, we can discern at least four (4) diagonal streets radiating outwards in all directions. Given the rapid growth in Doha over the last 30 years, it is extremely difficult to assign modern day names to these places but it appears, more or less, consistent with the modern ‘downtown’ area. The older town of Al Bidda appears to be eastward of this area. 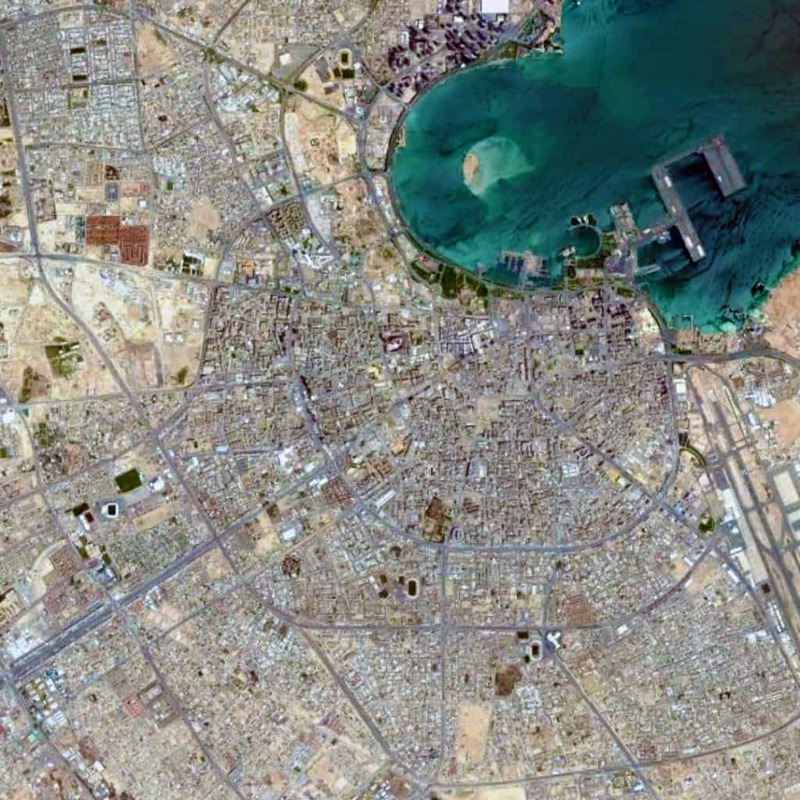 Satellite view from 15 km of Doha, Qatar (Source: Google Earth). 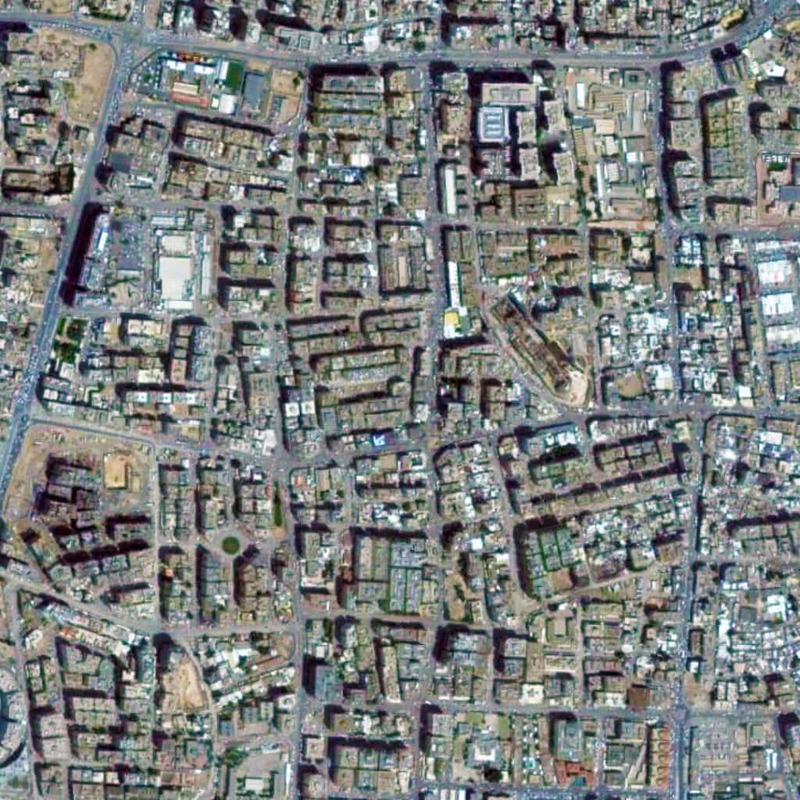 Satellite view from 2 km of a ‘super block’ neighborhood in Doha, Qatar (Source: Google Earth). This is more apparent if we zoom on one of these ‘super blocks’ (see the satellite view from 2 km above). We can discern the prototypical pattern you might in some older Middle Eastern settlements with narrower streets and a marginal offsetting of blocks, designed to subtly deter through traffic in the area. Functionally, this is more akin to Olmsted’s efforts to do the same in the Riverside suburb of Chicago, though representing a much different geometrical strategy. In fact, this is more practical than the modern suburbia model of massive blocks of nebulous shape and minimal street connections, which you will find in many post-war suburbs of the United States, especially those constructed over the last 40 years. It seems likely these attempts to retain a traditional type of urban pattern while still accommodating the requirements of a modern vehicular traffic system has resulted in a tension in the urban street network, especially due to the rapid growth during the early 21st century. 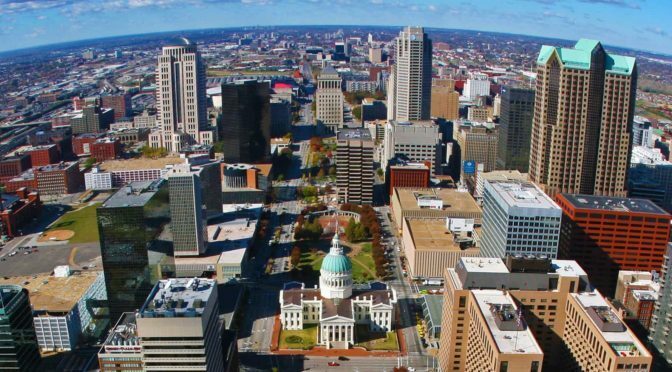 St. Louis is an independent city (meaning it is not part of St. Louis County) and major American port in the state of Missouri, built along the western bank of the Mississippi River, on the border with Illinois. The city had an estimated population of 311,404 in 2016. It is the cultural and economic center of the Greater St. Louis area (metropolitan population of 2.9 million people), making it the largest metropolitan area in Missouri and the 19th-largest in the United States (Source: Wikipedia). 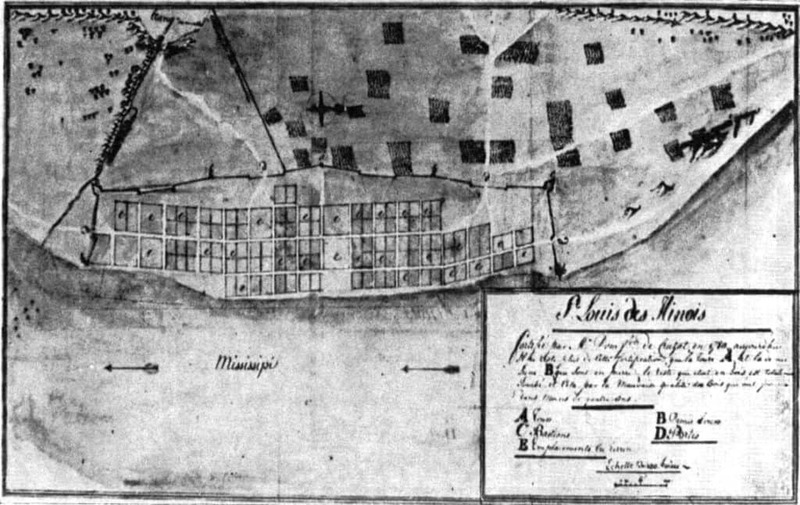 A map of St. Louis in 1780. From the archives in Seville, Spain (Source: Wikipedia). Prior to European settlement, the area was a major regional center of Native American Mississippian culture. The city of St. Louis was founded in 1764 by French fur traders Pierre Laclède and Auguste Chouteau, and named after Louis IX of France. In 1764, following France’s defeat in the Seven Years’ War, the area was ceded to Spain and retroceded back to France in 1800. Nominally, the city operated as an independent city after 1764 until 1803, when the United States acquired the territory as part of the Louisiana Purchase. During the 19th century, St. Louis developed as a major port on the Mississippi River. In the 1870 Census, St. Louis was ranked as the 4th-largest city in the United States. It separated from St. Louis County in 1877, becoming an independent city and thus, limiting its own political boundaries. In 1904, it hosted the World’s Fair/Louisiana Purchase Exposition and the Summer Olympics (Source: Wikipedia). 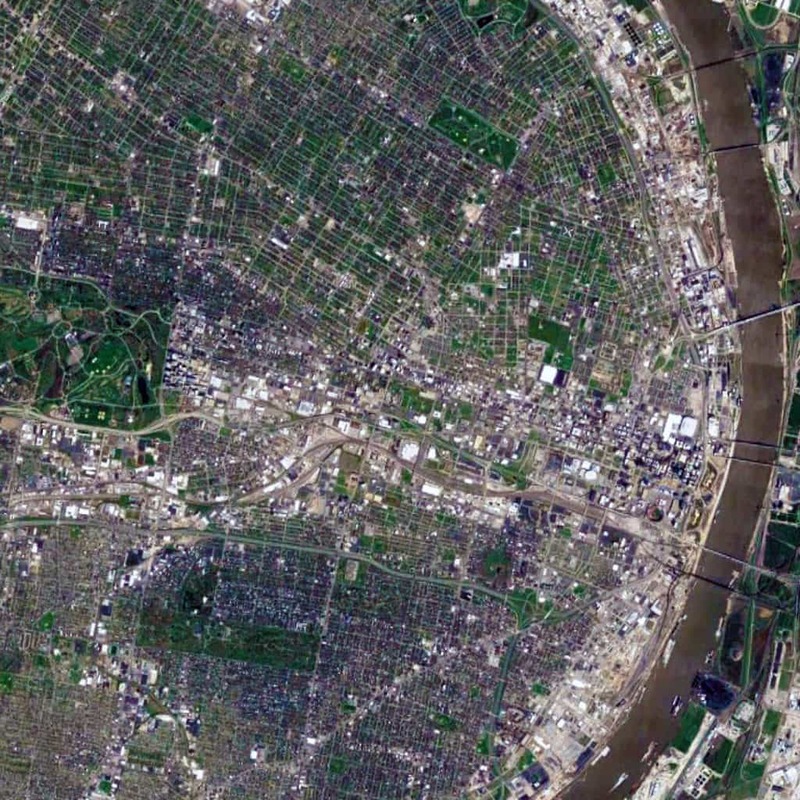 Satellite view from 15 km of St. Louis, Missouri in the USA (Source: Google Earth). The St. Louis urban pattern is composed of a series of small-scale regular grids of varying size, which are offset in relation to each other. This originally occurred due to adapting the regular grid layout to the topography of the Mississippi River adjacent to the riverfront at this location to ensure that most valuable lots were rectangular in shape for the purposes of buildability. Like other cities in the world composed of offset, regular grids (such as Athens, Greece and New Orleans, Louisiana), this – in combination with the distribution of land from afar by the French/Spanish crowns during the Colonial period – had a ‘cascade effect’ in shaping the layout and orientation of future parcels of small-scale regular grids in the city. Later, railroad lines running east-west introduced a very strong north-south divide in the city, which persists to this day. Oddly, this divide (historically reflecting a post-war racial divide in the city, e.g. whites in south St. Louis and blacks in north St. Louis) has been reinforced by Federal, state, and city planning efforts such as the Jefferson National Expansion Memorial (i.e. Gateway Arch) grounds on the riverfront in downtown St. Louis. 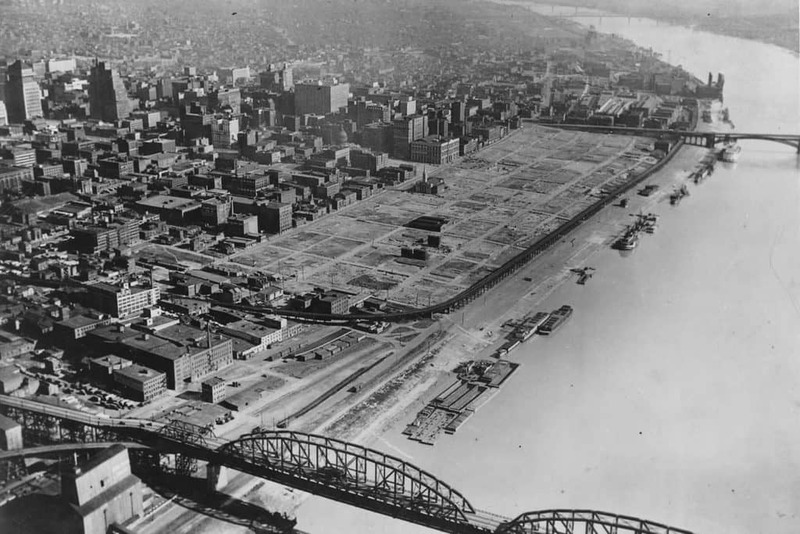 St. Louis’ Warehouse District – same size as two New Orleans’ French Quarters – demolished during the 1930s to (eventually) make way for the Jefferson National Expansion Memorial grounds and Gateway Arch though this riverfront land remained vacant for over two decades.